Every year, more than 2900 home fires are started by clothes dryers. The leading cause of these fires are from a build of up lint from lack of maintenance. The removable lint filter unfortunately doesn’t catch all of the cloth and fabric particles, so maintenance requires a little more than just emptying the filter after each load. Whether you live in your own home or plan to purchase in the near future, it’s important to have safeguards in place for the utilities that you use that could put your home at risk. You want to make sure that the lint that gets trapped in crevices and in the hose on it’s way outside are thoroughly cleaned. – Clothes are taking a lot longer to dry, and sometimes not even drying all the way. – Clothes may be hotter by the end of the cycle. – The outside of the dryer starts to get really hot. – The outside exhaust vent flapper isn’t opening much. – The laundry room begins to feel really humid. – There is a burnt smell in the laundry room. – A vacuum with a long hose attachment. – Dryer vent brush kit. 1. Remove the lint trap filter and make sure it’s completely cleaned off. You want to make sure you’re cleaning the filter after every load to help prevent lint build up. 2. Vacuum the space that houses the lint trap filter. The filter doesn’t capture all of the particles, and this is the second place the lint will begin to accumulate. 4. Make sure the duct is connected properly. You don’t want it cinched in any part of the duct, to prevent crevices where the lint can get stuck. No one knows the value your home has as much as us, keep it protected by taking some simple cautionary steps to keeping everything in running order. 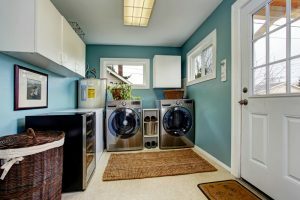 If you need recommendations of a service who will come out and clean your dryer vents or any other home service, we’d love to provide you with names of people on our preferred vendor list. Katie and the Scarlett Team made our home buying and selling journey seamless. With Katie’s extensive knowledge and experience, we were able to sell our house and buy our new dream home. Thanks Katie!! Wow this team knocked it out of the park! Made my first home buying experience enjoyable! Kyle is a hard working, honest person. I have worked with Kyle in the past and will work with him in the future. I am truly satisfied with my experience working with his group. He understands the market and provides an honest assessment based on data, experience and a great understanding of the region. Kyle was instrumental in the process of buying my first/dream home at an incredible price. He was responsive throughout the entire process. I walked into a lot of equity and I would highly recommend him to anyone who wants a similar result. On the spot with quick responses, great information. Very fun to work with on investments. Kyle and his team were fantastic helping me and my fiancé purchase our first home! He was able to answer all of our questions as first time home buyers, and always got back to us fairly quickly! Many thanks to Kyle and his team! The data relating to real estate on this Web site derive in part from the Carolina Multiple Listing Services, Inc. IDX program. Brokers make an effort to deliver accurate information, but buyers should independently verify any information on which they will rely in a transaction. All properties are subject to prior sale, change or withdrawal. Neither Scarlett Real Estate, LLC nor any listing broker shall be responsible for any typographical errors, misinformation, or misprints, and they shall be held totally harmless from any damages arising from reliance upon this data. This data is provided exclusively for consumers' personal, non-commercial use and may not be used for any purpose other than to identify prospective properties they may be interested in purchasing. © 2019 Carolina Multiple Listing Services, Inc. Data last updated 2019-04-25T08:58:54.097.